Recently Kehres Health was featured on healthcentral.com in the article Food and MS: Nutritional Food Sources by Vicki Bridges. 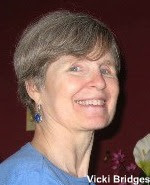 Diagnosed with Multiple Sclerosis in 1989 and a long time Amigo owner, Vicki shares her experiences and knowledge as a regular contributor to healthcentral.com and through her blog Down the MS Path. The article includes health tips about gluten-free diets, magnesium, vitamin D and fish oil, as well as sugar. "In excess, sugar is poison to our body and creates unwanted stress on our hormones and nervous system,” Dr. Dan Kehres said. “The majority of grains convert into sugar as soon as they are digested, so grains can be just as harmful to our bodies as sugar. When reading nutrition labels, basically anything that ends in the letters '–ose' is going to be a sugar, including fructose, sucrose, glucose, etc." Read the full article here. Thank you Vicki for including Kehres Health in your article! Thousands of years ago, humans had to hunt and gather food. Today, we still have to hunt and gather – but in a much different sense than we used to. For example, with a little searching you may be able to buy free-range organic eggs from a local farmer or find minimally processed stone ground bread in the freezer section at your local grocery store. To quickly navigate through a grocery store to find the healthy options, avoid the middle of the store. Grocery stores are typically set up with all the very processed foods in the main aisles and the healthier foods around the outskirts. At first it may seem overwhelming and expensive but before too long you will be spending less time shopping and probably even less money than you were before. •Meat - Amish, hormone-free meat from a locally owned meat market. I go to Ted’s Meat Market in Saginaw (5660 Bay Road). •Vegetables - locally grown vegetables when in season from the farmer’s market, otherwise I buy organic produce from larger grocery stores. •Eggs – Dorothy at Jen’s work brings in eggs from the chickens she raises. They are free-range, organic and hormone free… for just $1.50 a dozen. Check with local farmers for healthy eggs at a very affordable price. It is pretty neat to buy eggs from a place where you can actually see the chickens roaming around the fields. •Nuts – Target has Archer Farms brand raw, unsalted nuts. •Coconut Oil – nearly every local health food store has coconut oil (great for cooking and/or skin lotion). Lately, I’ve been getting it from The Purple Coneflower in Bridgeport (6228 Dixie Highway). Spend a little extra time hunting for healthy food and you can become a modern day hunter gatherer, and avoid becoming a food zombie. As asthma becomes more prevalent so does the use of asthma drugs. Unfortunately, these medications don’t come without a cost both physically and financially. Many asthma medications seem to reduce asthma at first, but ultimately mask the underlying problem while potentially causing life threatening conditions. Due to safety concerns, as of February 18, 2010, the U.S. Food and Drug Administration (FDA) is requiring changes in four of the major asthma medications; Advair, Serevent, Foradil and Symbicort because of their potential life threatening side effects. It is estimated that 22 million Americans have asthma, and more than 6 million Americans use one of the four medications mentioned above. There are many other types of treatment for asthma that don’t have the risk of life threatening side effects. Chiropractic is a natural treatment that has been shown time and time again to help relieve and prevent asthma in many patients. The stress from our daily lives puts excess stress on our bodies and our nervous systems. Chiropractic helps to reduce the stress on our bodies, reducing inflammation and increasing joint motion. Proper joint motion in the mid back is especially important for people with asthma as it increases rib motion, allowing more oxygen to be inhaled. With all joints moving and inflammation reduced as much as possible, our nervous systems can function properly which is essential for true health. Elimination of dairy and inflammatory processed food has also been shown to greatly reduce asthma symptoms. Consider chiropractic or other types of natural treatment for asthma, to avoid the risk of potential life threatening side effects, especially with children. I couldn’t be happier to announce the arrival of my new nieces Ella Marie and Teagan Avery at 6:20 a.m. February 16th! They were born at 32.5 weeks, but are big for twins and are very healthy. Ella weighs 5 lbs, 13 oz. and Teagan weighs 4 lbs, 9 oz. They are being monitored in the NICU, but are already breathing on their own and feeding! Their parents Pat and Aimee Kehres are doing great and are very excited with their arrival. Click here and here to see videos of the twins. With Valentines Day right around the corner there is no better way to show someone you love them than with a box of chocolates…or is there? How about with a box of healthy chocolates! In 2004, researchers put together a diet called the Polymeal. Their research showed that if this diet was followed closely and eaten everyday, it would reduce the risk of cardiovascular disease by a whopping 75%. One of the key factors to improving heart health is… chocolate! The diet also included wine, fish, nuts, garlic, fruits and vegetables. Cocoa, the main ingredient in chocolate, contains flavanols. Important compounds that promote healthy blood flow, flavanols reduce the risk of cardiovascular disease and stroke. Unfortunately, not all chocolate contains enough cocoa to promote good health. Only chocolate containing 70% cocoa or higher has enough flavanols to provide health benefits. You can tell how healthy chocolate is by how it tastes -- the more bitter it is, the healthier it is. Try to stay away from milk chocolate, white chocolate and any chocolate mixed with caramel or other sweets since they don’t contain any of these health benefits. As I often have to remind my fiancé… moderation is key! Featured in the film Food, Inc., Salatin lets his livestock graze on grass, the way nature intended, his animals are healthier, he uses sustainable, eco-friendly farming practices and Polyface Farms meat tastes better. Directed by Robert Kenner, Food, Inc. was recently nominated for an Oscar for Best Documentary and is a must watch for anyone that cares about their health and wants to learn more about the food system. In the past 60 years, food has been produced at a rate much faster than we have ever seen in history – at a cost of our health. Global food production is primarily controlled by a handful of multinational corporations with a stronger emphasis on business than health. These corporation’s goals are to produce as much food as possible at the lowest cost and largest profit margin. Putting health as a number two priority has led to 1 in 3 Americans born in 2000 developing early onset diabetes; among minorities, the rate will be 1 in 2. To change our current food system and improve our health, the public needs to demand healthier food and fix our current systems. In 1972, the FDA conducted 50,000 food safety inspections. In 2006, the FDA conducted only 9,164. Want to know why a fast food hamburger costs more than a head of broccoli? 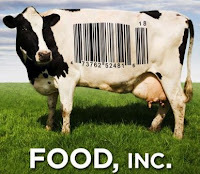 Rent or buy Food, Inc. Visit FoodIncMovie.com for more information, watch the trailer.